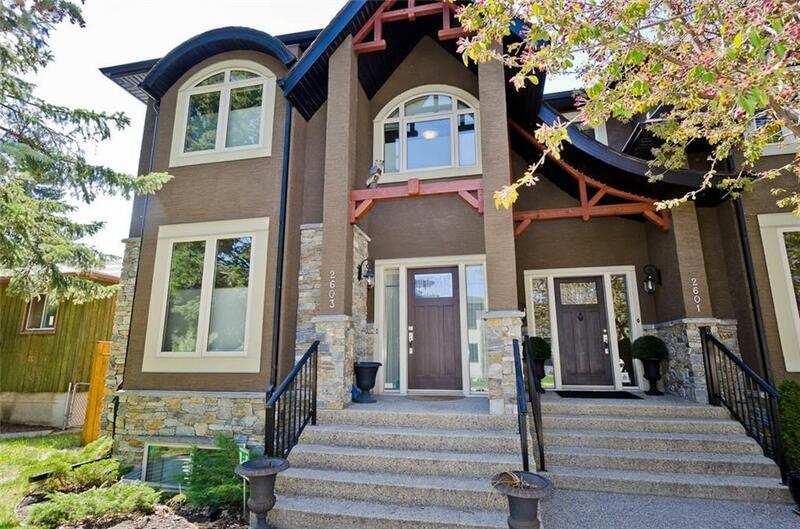 DESCRIPTION Inner city living at its finest in this luxurious & upscale home. On a beautiful tree lined street close to downtown. Functional & open plan with extensive details throughout. A perfect gourmet kitchen, top of the line appliances & large breakfast bar open to large dining area. Love the great room with built-ins, fireplace & stunning ceiling feature. Natural sunlight fills this home making it light & bright. Floors are finished in hardwood & ceramic tile. The wrought iron staircase leads you to the upper level with vaulted ceilings. The huge master bedroom features 5 pc en suite with soaker tub, separate shower & two sided fireplace. This level also features two additional bedrooms, 4 pc bath, laundry with cabinets & sink. Lower level features 4th bedroom, 3 pc bath, large family room with bar perfect for entertaining. The home is very comfortable with in-floor heat in lower level & is equipped with air conditioning throughout. Fully fenced & landscaped with a double detached garage. This home is PERFECT! Home for sale at 2603 25 ST Sw Calgary, Alberts T3E 1X7. Description: The home at 2603 25 ST Sw Calgary, Alberta T3E 1X7 with the MLS® Number C4225673 is currently listed at $699,900.